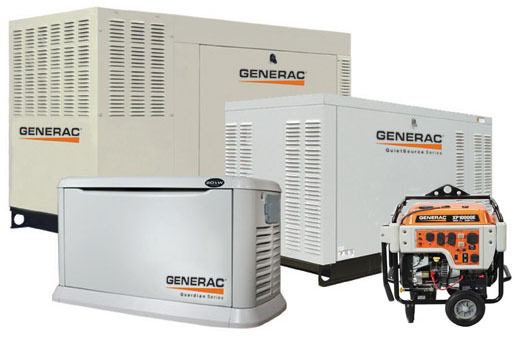 Generac manufactures a wide range of quality stand-by generators from 2000 watts to 2 million watts. Generac provides quality emergency power for households, portable, and commercial applications. Based in Waukesha, WI with sales and service locations worldwide. Power Pros carries the full line - if you don't see it listed, please contact us for help or for a quote. Portable generators are a welcome addition to many activities at home, at work, and away. In an emergency, portable generators can provide critical backup power. They make camping and tailgating more comfortable. And contractors appreciate the flexibility portable power brings to the jobsite. A permanently installed Generac home backup generator protects your home automatically. It runs on natural gas or liquid propane (LP) fuel, and sits outside just like a central air conditioning unit. Available from 6kW to 20kW.